Mercury's extremely dark surface has long been a mystery for scientists, but a team led by researchers at Johns Hopkins University believes it may have figured it out. Their newly published study points to carbon as "the darkening agent." The evidence supporting this hypothesis came from NASA's spacecraft MESSENGER which spent 2011 to 2015 surveying the planet's surface. Using readings from its neutron spectrometer, scientists were able to match the data collected with the qualities of graphite. Additionally, they believe the evidence indicates that the source of the material is not from comets, as previously thought, but from the depths of the crust. The carbon is thought to have been transported to the surface through impact craters left after large bodies smashed into the planet. As such, Mercury's surface is estimated to contain "weight-percent levels of carbon, likely in the form of graphite." This concentration is much higher than that found on Earth or Mars. 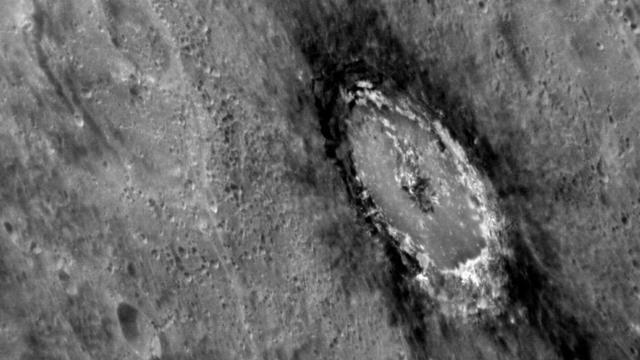 The researchers hypothesize that, in Mercury's early history, the hot magma that covered it eventually cooled, leaving carbon to form the crust that lies underneath.